Chocolate and mint are a match made in flavor heaven. Let’s face it. Everybody loves mint and chocolate. In fact, I don’t know anyone who doesn’t like it. And those of you who are out there, I prefer not to stay in denial about you. The weird thing is: how did mint become associated with St. Patrick’s Day? I mean, think about it. Yeah, St. Patty’s Day is all about wearing green, finding shamrocks and catching leprechauns, and everyone knows they wear green. Yet somehow mint happened to fall into the same March 17th category… but I’m not complaining. It’s just one of those weird things, okay? But all weirdness aside, I embrace it. Chocolate and mint are as meant to be as green is meant to be with St. Patty’s Day. It just works. And you know what else works? 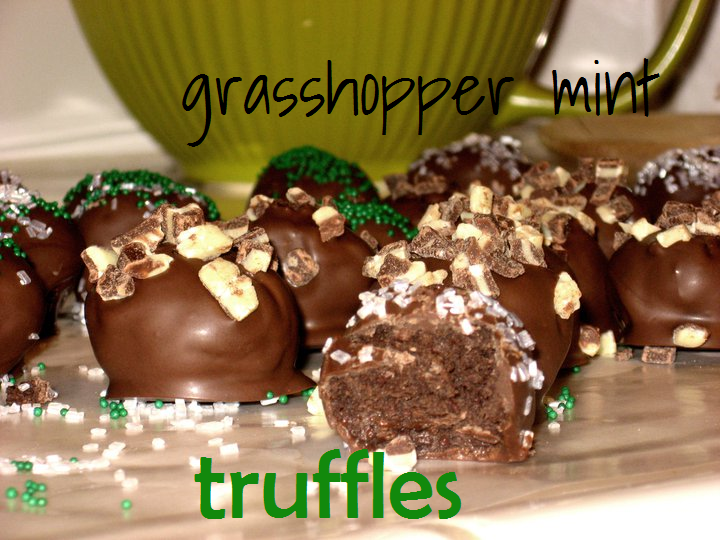 These delectable grasshopper mint truffles I adapted from the ingenious Kristan over at Confessions of a Cookbook Queen. Get this: they’re made with crushed Keebler Grasshopper cookies. Who would have thought? And they are oh-so amazing. Another match made in heaven with St. Patty’s Day, or hell, just about any day you want something chocolate-y, minty, and truffle-y, cos these have it all. *Adapted from Confessions of a Cookbook Queen’s Thin Mint Truffles. 1. Using a food processor, crush cookies in batches until they form a fine crumb consistency. Make sure there aren’t lots of chunks; it needs to be pretty fine. Place cookie crumbs into a large bowl. Add softened cream cheese and mix together until everything is well combined and you do not see any remaining cream cheese. (Not gonna lie: You’ll more than likely need to get dirty and use your hands to do the mixing). 2. Once mixture is blended, roll dough into small inch-sized balls and place on a large cookie sheet. Chill for about 30 minutes. Meanwhile, prepare chocolate bark for melting according to package directions. Once balls have chilled, carefully dip balls into melted chocolate, coating completely. I used two toothpicks to dip, but you could use a small teaspoon as well. Place chocolate-covered truffles onto a wax paper lined baking pan, and sprinkle with non-pareils, sprinkles or crushed Andes mint candies. Chill the balls for about 10 minutes or until firm.